[Hannah Tamimi | Banner] Jonathan Lotero (left), junior architecture major and 2-meter player, attempts to knock down a pass by Kyle Rasmussen, freshman health science major and 2-meter player, in a scrimmage. 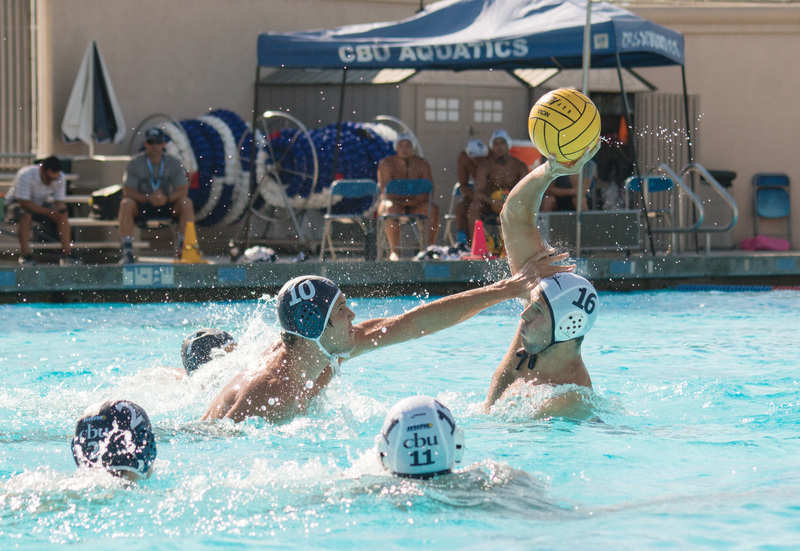 After a fourth-place finish in the Western Water Polo Association last season, the men’s water polo team at California Baptist University looks to carry the momentum from last season’s finish into the new year. Joseph Moorman, senior psychology major and goalie, said despite the losses, the team showcased many positive aspects of their game. With 14 returners, the team’s chemistry has flowed well over the summer season and into the current season. Out of the 24-man roster, 10 newcomers have added depth to the team’s already competitive spirit. Rosa said with the mix of old and new, leadership roles have developed and the team’s abilities have stretched across the board. Moorman said the team is already showing its speed. “Our reactions and transitions are faster, and we seem to be communicating a lot better,” Moorman said. The next round of games begins Sept. 9-10 at Princeton University in the Princeton Tournament, which will present the team an opportunity for improvement.